Discussion in 'Software, Computers, CMC's Techie Stuff' started by David Waldmann, Sep 28, 2017. Since PhotoBucket went the way of, well, something, I've been wondering where to put pics to post on various sites including TG. This morning I thought "I have plenty of space on DropBox, and you can share pics from there". But when I tried it, it don't work. That's because it's not a "actual" picture, but a link to a Page that has the picture on it. Anyone have any suggestions for a PB type site that is either free or cheap? I have web space but the nice thing about these pic-specific sites is that they make it so easy to use from any device or location. Well, I did discover that I can use the DB link and go to the page, then Copy Image Address and use that address for the pic. At least, I think I can - I can see it here, not sure if it's Public. Kind of a pain though. I believe that you can upload pictures directly, but using a hosting site is kinder to the Grumble server capacity. Yes, you can on TG, and FB. But in addition to being kinder* to TG server, there are other sites where you can't, so I'd like to be able to figure out a way to just use one, kind, method. *Did you know that, no matter how kind your children are, German children are always Kinder? shayla, JWB9999999, neilframer and 1 other person like this. That is a proper dad joke, I salute you sir! shayla and David Waldmann like this. For those who have a website. Why don't you use your own server to post images here? 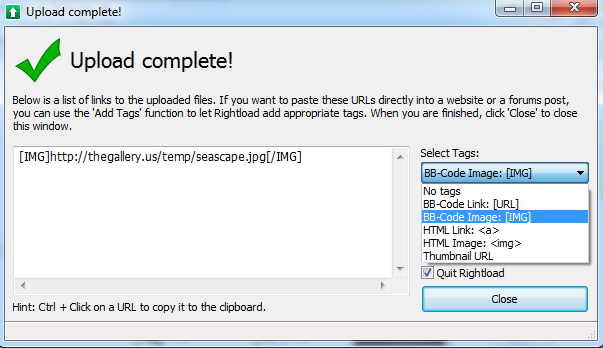 After uploading it shows you the BB-Code Image tag and others. It's also useful to email customers images without overloading your email server.